When it's time to shop for Christmas toys for kids, getting them what will keep them entertained is easy if you know what the hottest toys are. Not all parents or adults pay attention to the commercials that come on touting the wonders of the latest toy, but you can bet the kids are paying attention - and those toys are tops on the wish list. One of the toys that quickly became all the rage this year is DaGeDar. If the name means nothing to you (yet), it's a ball racing game - but not an ordinary ball. These are the kind that are made for adrenaline pumping action - they're racing balls! The DaGeDar are a collection of balls that have different characters on them (over 100 characters so far) and it's the pictures of the characters that inspire kids to collect them. The characters have names like Scissor Kick Kid (the character that looks like a ninja) or Click, Rhinasty (pronounced Rye-nasteee) and Dra-zard name a few. 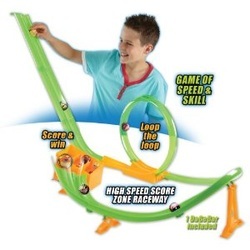 Kids love these toys - they have cool characters they can collect, they have trading cards they can collect and share with friends - and then there is the racing action. DaGeDar balls are fast and shoot quickly from the launcher when they're in play. Kids gather around a table to launch and race their characters, earning mega bragging rights when their character comes in first! There are currently six different sets of the balls, but these aren't just regular balls with a cool graphic printed on it. They're durable balls that have a story to tell behind the creation of the character, and kids can discover that story by going to the website and typing in the code. They'll found out which spirit is caught inside the racing ball. When kids go to the My Dags part of the site, the page begins 'scanning' eyes for identification and kids love the high tech appeal of that. The balls can also be carried around in a special Flip Action Carrying Case for those battles on the go. Some of them are considered rare collectibles. With the collectible balls, the raceway and launchers add to the fun (and competition). Opponents send two balls down the DaGeDar High Speed Score Zone Track simultaneously to see who lands in the highest score zone. Kids love watching their ball race side-by-side down the drop, then push its way to the front as their ball charge through the loop and lands smack in the Score Zone! This super-charged, super-slick racetrack is sure to thrill players of all levels, and sure to challenge even the most experienced Baller! Like this Christmas toy for a boy but want something more for outside play? How about a Nerf Vortex Vigilon?